Nigeria's government has ordered banks to refuse to accept deposits in coins it introduced just four months ago. The coins are proving so unpopular that Nigerians are refusing to carry them - they just leave them in the bank. "Carrying them around is such a hassle and I just can't be bothered because they aren't worth anything," Abuja office worker Jane Goroh told the BBC. The central bank hopes that people will have to use the coins, if they cannot put them in the banks. The largest denomination two naira coin is worth about one-sixth of a US cent. "Our customers don't accept them. That's why we don't accept them either," Victoria Fakuade, who owns a roadside stall, told the BBC News website. Ahmad Isa, who was seen rejecting change in coins, said he could not accept the money because it was hard work carrying coins around. "What can I buy with coins? Can you imagine how many coins, how much metal I'd have to carry, to buy a bottle of coke which costs 50 naira (40 US cents)?" Mr Isa asked. The Central Bank of Nigeria says the coins are light and easy to carry around and insists that Nigerians must embrace them. It introduced the new bank notes and coins, worth 2 naira, 1 naira and 50 kobo, in February. But another petty trader Usman Mohammed, who had a box of coins sitting in his stall, says he accepts them because they are beautiful. 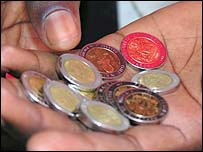 "I like the way they look and it'd be good if Nigerians can learn to accept and use the coins. It's beautiful money," Mr Mohammed says. He advised the central bank to embark on a public enlightenment campaign to encourage people to use the coins.